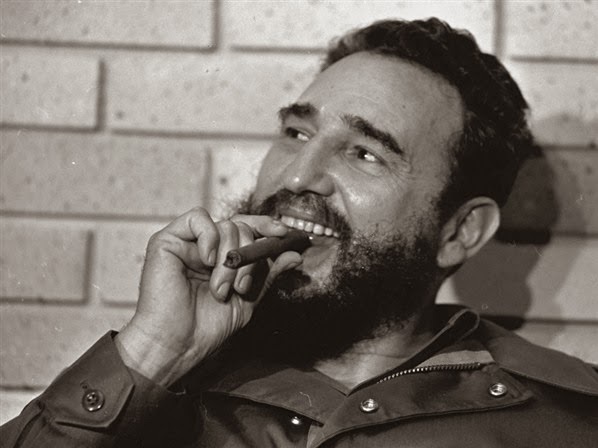 Cuba and the United States of America have shared a love/hate relationship since European colonies in the New World began trade in tobacco and sugar in the early 18th century: plans for purchase of Cuba from the Spanish Empire were put forward at various times by the United States. As the Spanish influence waned in the Caribbean, the United States gradually gained a position of economic and political dominance over the island and by 1877 the United States accounted for 83 percent of Cuba’s total exports. In 1897, U.S. President William McKinley offered to buy Cuba for $300 million; rejection of the offer along with the sinking of the USS Maine led to the Spanish–American War, the Treaty of Paris, U.S. military rule of the island until 1902 and continued U.S.military intervention for another two decades. By 1926 U.S companies owned 60% of the Cuban sugar industry and imported 95% of the total Cuban crop, and the rise of General Fulgencio Batista in the 1930s led to an era of close co-operation between the governments of Cuba and the United States. Havana was known as “The Paris of the Caribbean” and the Island was a playground for the wealthy where Hollywood rubbed shoulders with the mob. 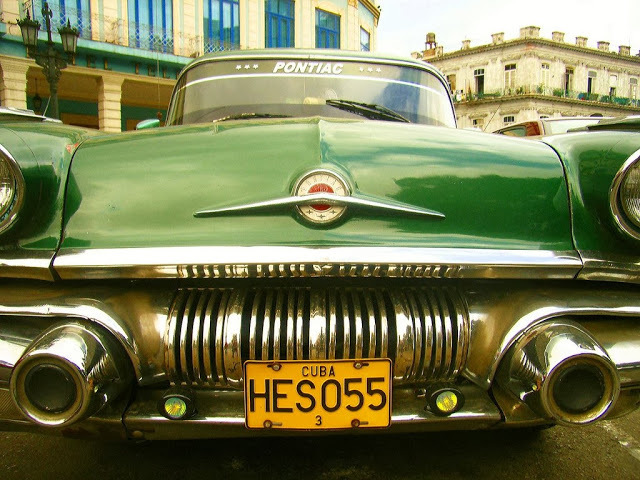 During its heyday Detroit and its environs were home to hundreds of automobile manufacturing companies and many of the cars were exported to various parts of the world: by the early 1950s Cuba was the leading foreign market for North American automobiles. 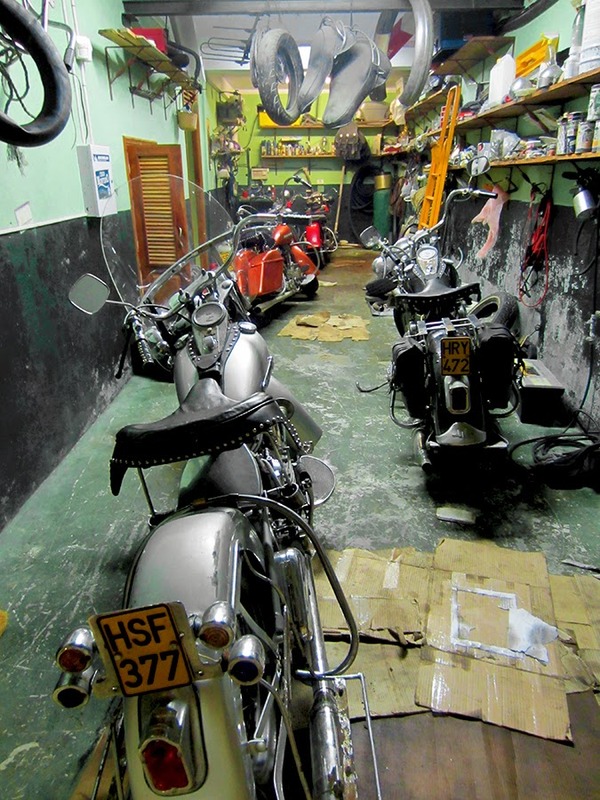 In 1952, 77,000 of Detroit’s finest were at home on the Island and by 1955 the number had increased to 125,000. 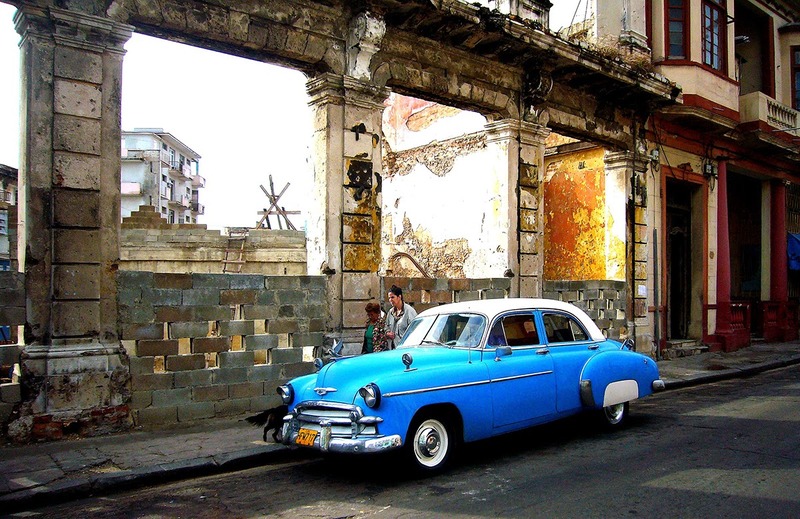 So lucrative was the Cuban market that in 1956 some new models were premiered in Havana before being unveiled in the States; the first 1957 Chevrolet display in Havana drew a crowd of 40,000 people and total new car sales for the year exceeded 14,000. The flow stopped in late 1959 when Fidel Castro’s economic reforms prevented Cubans from buying cars on credit. The subsequent U.S. trade embargo also denied Cuban motorists a direct source of replacement parts; Cubans were left with a transportation system dependent upon a finite and fixed stock of American-made cars, trucks, and buses. 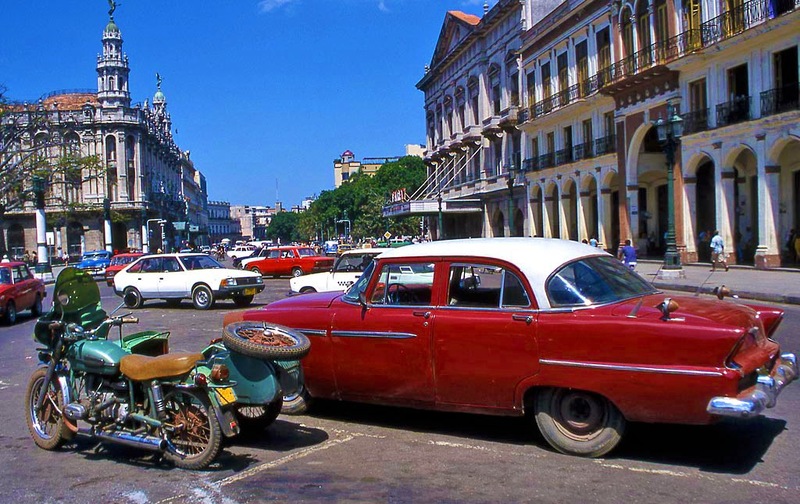 As the revolution gained momentum, the government decided that private ownership of automobiles reinforced class distinctions and public transportation would be the great leveler of society. 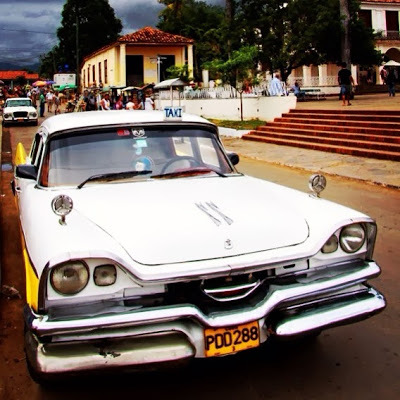 In 1959 individuals who owned a car were granted full private ownership of their vehicle and issued a traspaso, the critical document allowing the family sedan to be legally sold, traded, pawned, inherited, or used as collateral. 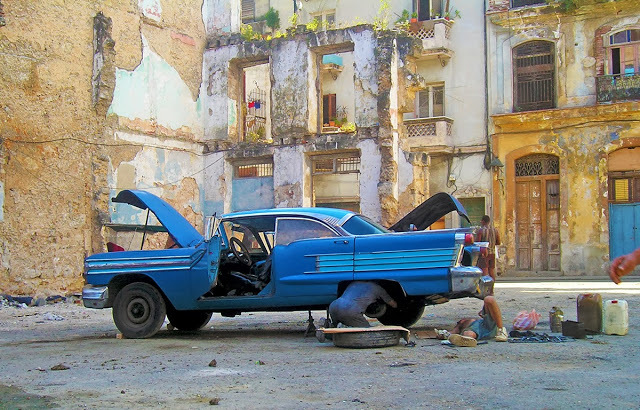 After 1960 full private ownership of cars was prohibited; they could only be driven, fueled, and repaired in situations similar to a lease agreement. At the end of its assignment the car is sold back to the government at an officially dictated price. 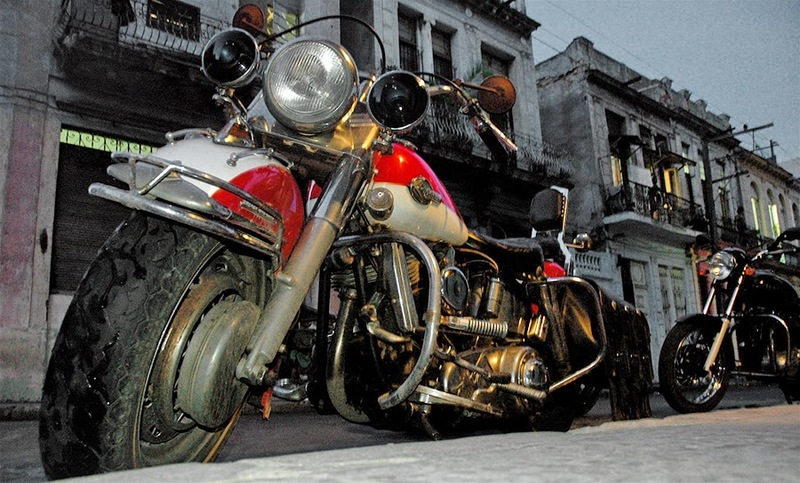 In Cuba a traspaso is worth its weight in gold. 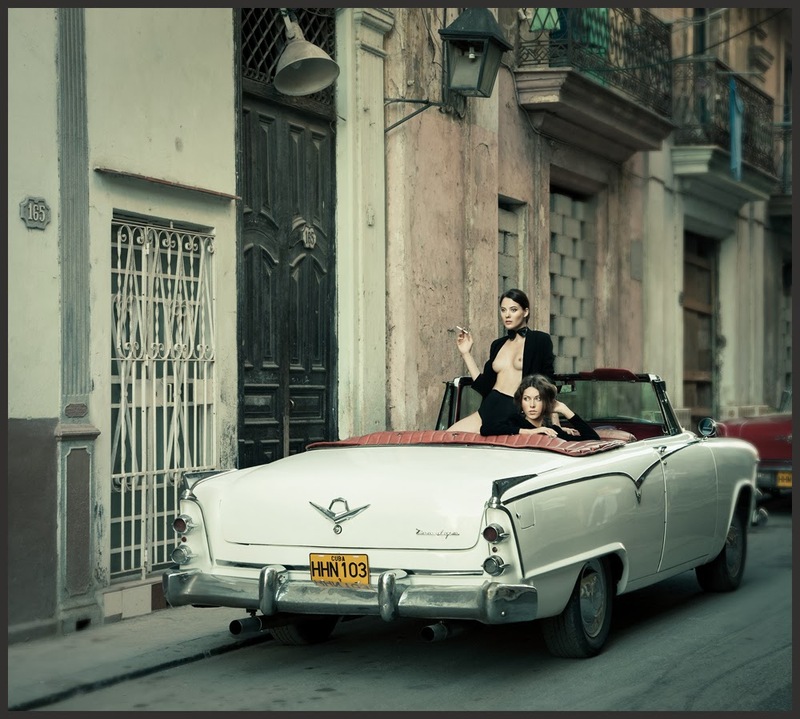 “The Cadillac costs thousands of dollars of our foreign exchange. 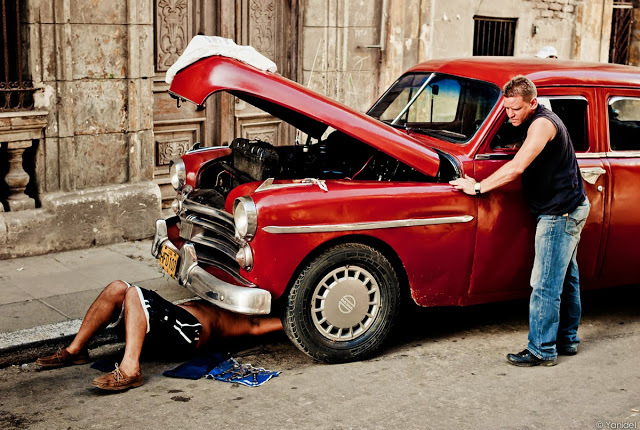 The Cadillac does not plow, the Cadillac does not cultivate, the Cadillac does not produce. What the Cadillac does do is waste 12 gallons per kilometer… The Cadillac does not provide jobs for anyone. 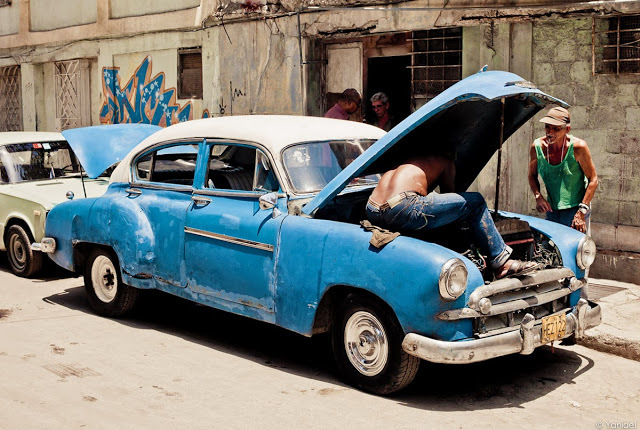 The Cadillac does not increase the wealth of the country, it diminishes it.“- Louis A. Perez Jr.
After 1960 the Soviet Union began supplying the island with Volgas, Moskvich 1500s, Ladas and other Eastern Bloc cars mainly for State use. 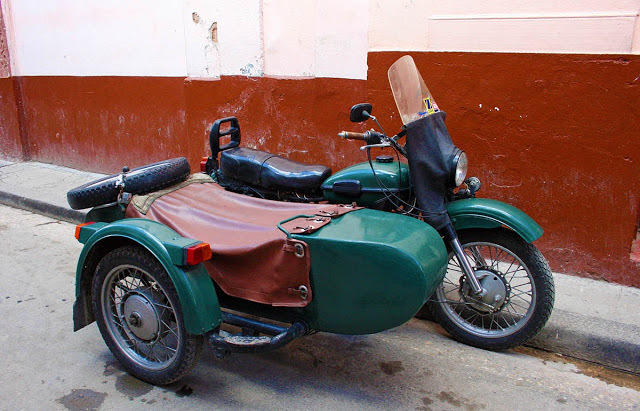 The CCCP also sent heavy trucks such as the ZIL and KrAZ, and of course IMZ, KMZ and IZH motorcycles. A few cars also began trickling in from Europe and, more recently, Asia; since 2009 Cuba has imported sedans from Chinese automaker Geely to serve as police cars, taxis and rental vehicles. 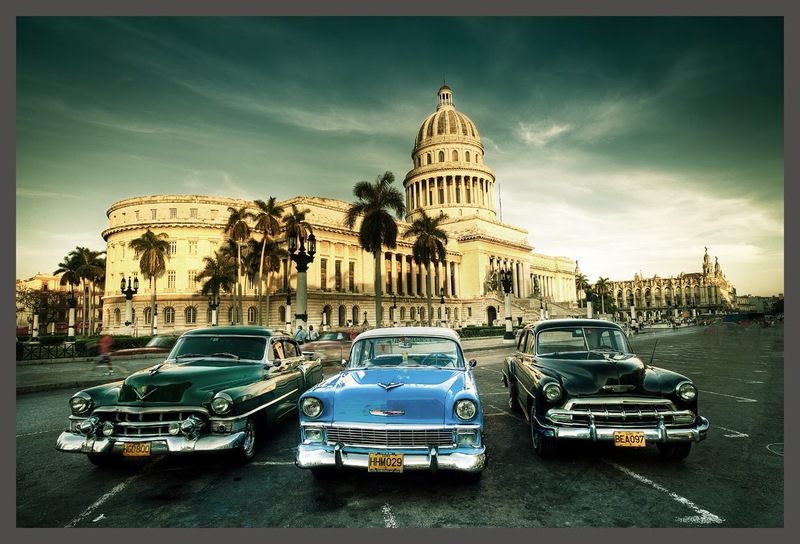 There is still no such thing as a private European or Asian automotive dealership in Cuba selling new or used cars to regular Cubans. 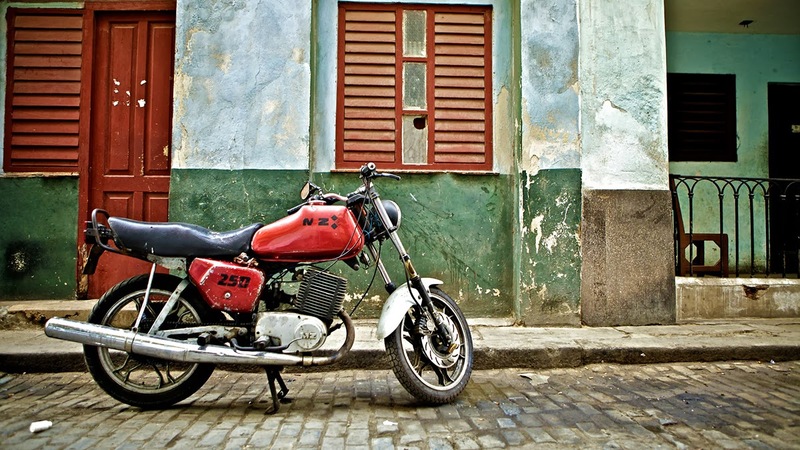 Peugeot, Mercedes Benz and Fiat do have dealerships based in Cuba, but they are only allowed to sell to State and foreign companies and some “very special” individuals who have official authorization. 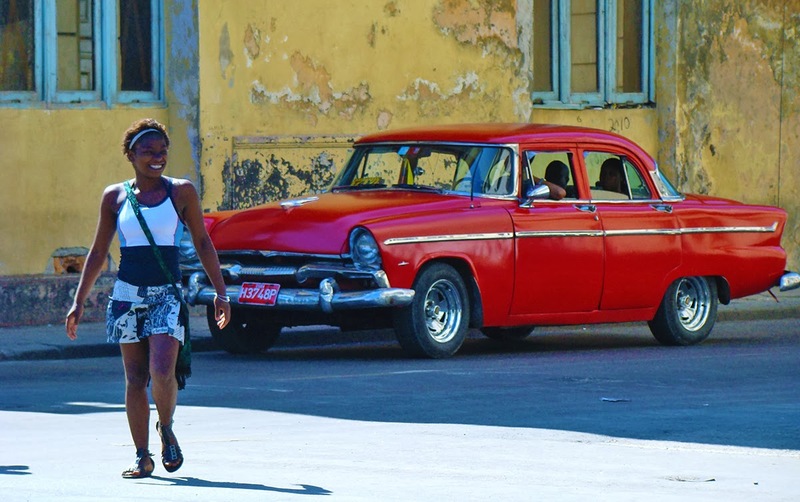 While many older Soviet and European cars remain in service in Cuba, they are largely eclipsed by the island’s great 1950s American automobiles, collectively known as “Yank Tanks”, “Cacharros” or simply Máquinas. Today an estimated 60,000 vintage American vehicles are still running, nearly all of them in private hands. Cubans have become expert at adapting or fabricating parts for vehicles that would long since have been recycled in other countries; many of the old American cars have been modified with newer engines, disc brakes and other parts scavenged from Soviet cars. 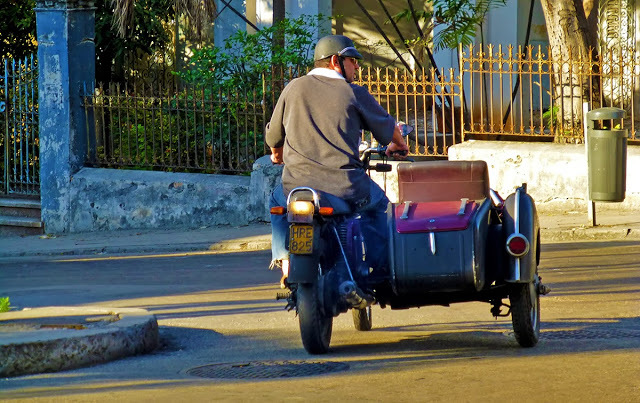 Another issue is fuel efficiency: with high prices and regular gasoline shortages many have been converted to diesel. Economics dictate that people often load vehicles past the maximum allowable weight and that, combined with the decaying roads, results in even more abuse to the already under maintained vehicles. 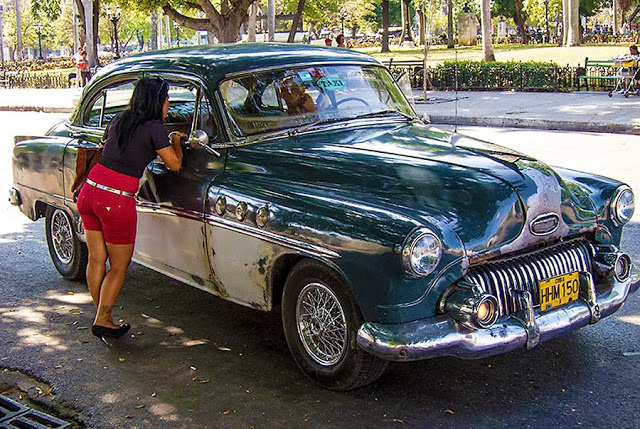 Although practicality dictates that most of the vintage cars in Cuba are working vehicles as opposed to polished show cars, many have been lovingly preserved in their original condition. There is some argument that “Cubans love new American cars, not old ones” but it may be a mistake to overlook the role of nostalgia in the survival of Cuba’s classic Detroit fleet. Many citizens associate the old cars with a golden era in the country’s history before widespread poverty, unemployment, and the yawning gap between social classes. In a romantic sense the cars represent a glamor largely annihilated by the Revolution. 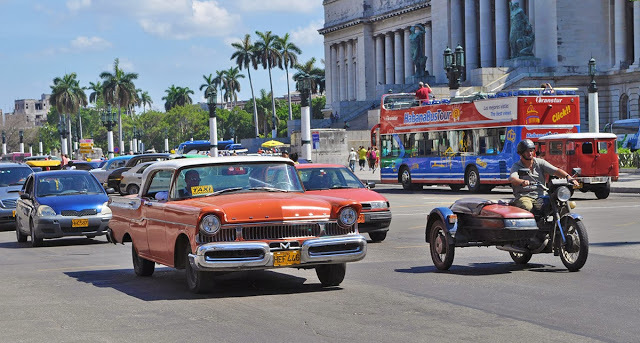 Vintage car clubs like A lo Cubano, The Cuban Antique Car Club and Amigos de Fangio abound in Cuba with members fiercely loyal to their favorite make, and events such as the Havana Classic Car Rally serve as evidence that the cacharro is close to the heart of many Cubans. Most owners of these Cacharros are also fully aware that they are sitting on potential “gold mines”. 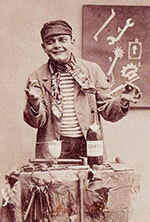 If the embargo were to be lifted many of the machines could be turned into quick cash by collectors in the US. When the Soviet Union basically collapsed and financial aid dried up in the late 1980s, the Cuban national economy went into freefall. 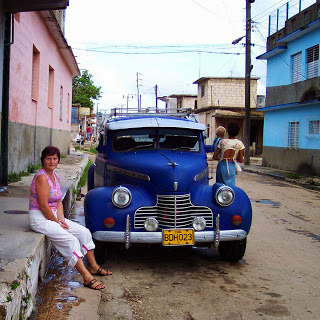 Beginning in ’89 Castro adopted the exports of vintage cars as one of several strategies to raise much needed foreign currency; based on the government’s assumption that the old cars were in great demand among foreign collectors, officials began to either buy them outright from private owners or to offer new Ladas in trade. 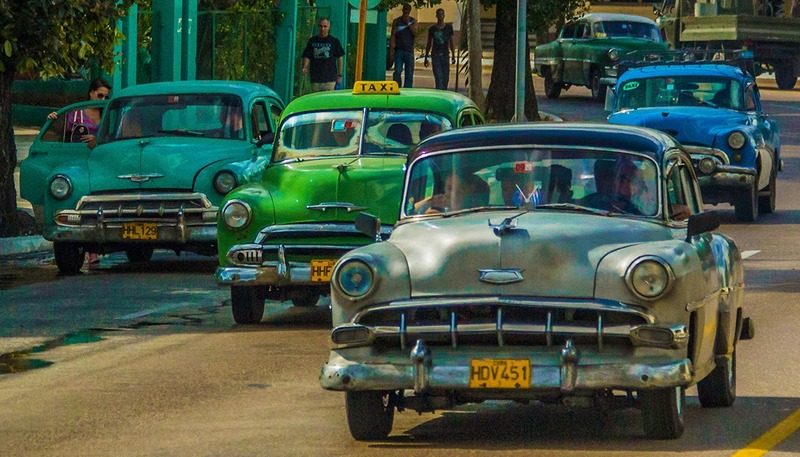 Designated locations in Havana became de facto used car lots where a select few -mostly Canadian and European- collectors managed to purchase and ship out several hundred vintage vehicles. It was a brief window though, and by 1994 the vintage car sale was terminated. 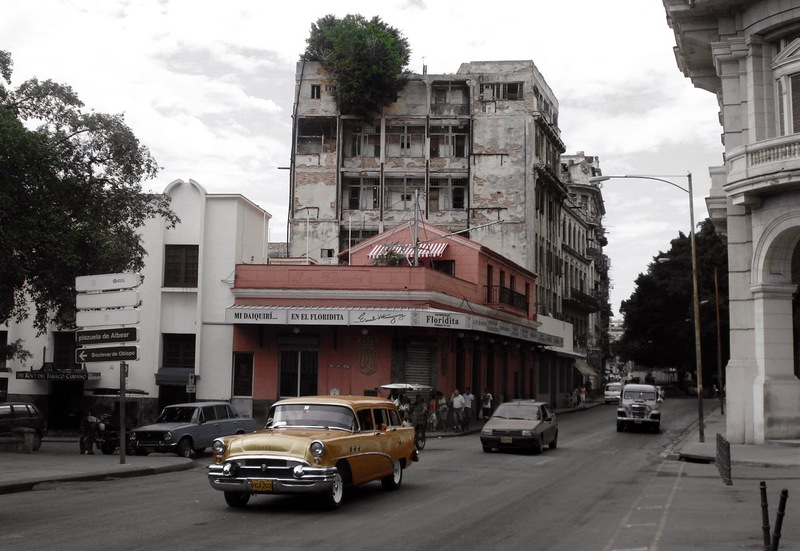 One explanation is that some officials were pocketing the proceeds, another is that Cuban citizens complained that the cars which had only survived owing to their own hard work were passing into the hands of foreigners who could not possibly appreciate them as much as the original owners did. Eduardo Mesejo, director of Havana’s Museo del Automovil, asserted that the Cacharros were a source of “national identity” and some of the nation’s rarest and most collectible models were being exported. Mesejo likened them to the concept of struggle; for half a century the Cubans had been called upon to “prepare for battle, to resist the enemy, to forge an “ anti-imperialist ” identity and solidarity.” But for most people on the Island the battle was not against armed invaders, it was with chronic shortages, long lines, a bloated bureaucracy and a declining standard of living. 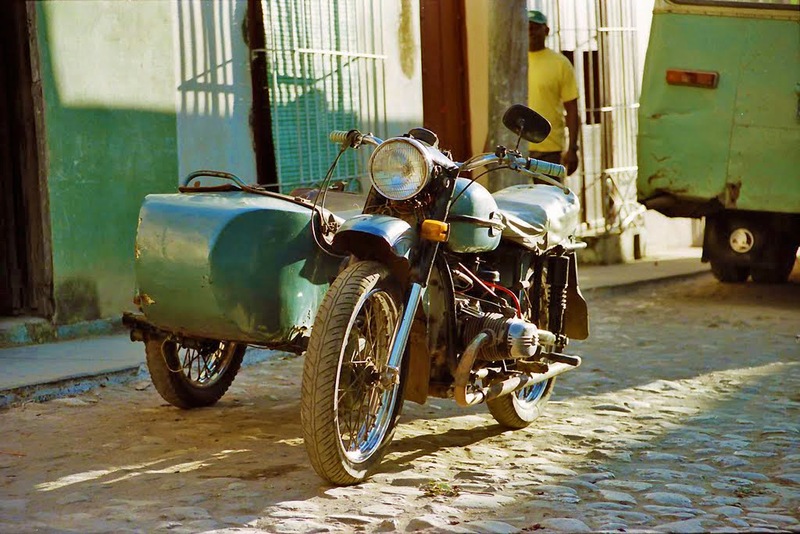 He argued that these are the very same issues associated with trying to keep a vintage vehicle running, and the adopted cacharros have ceased to be American and have become symbolically Cuban. 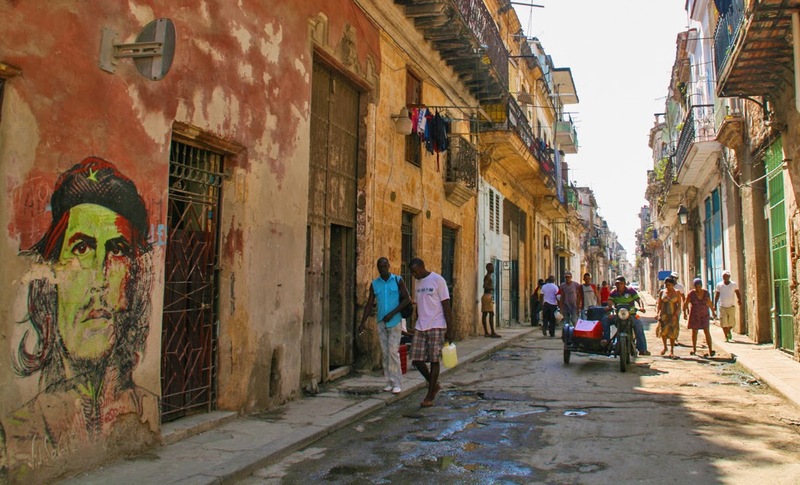 Mesejo’s cause was taken up by Eusebio Leal, the official Historian for the City of Havana. 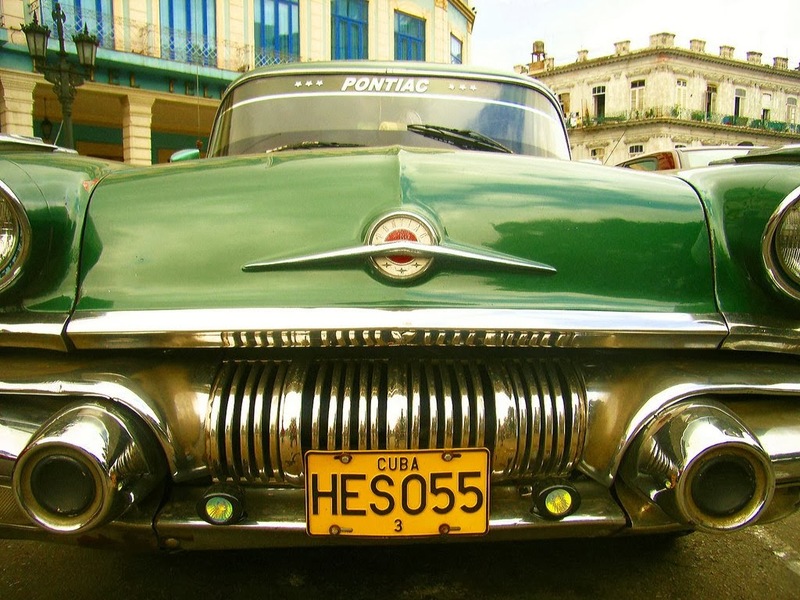 Officially, the government now regards antique cars as national treasures and forbids the export of such “cultural icons”. 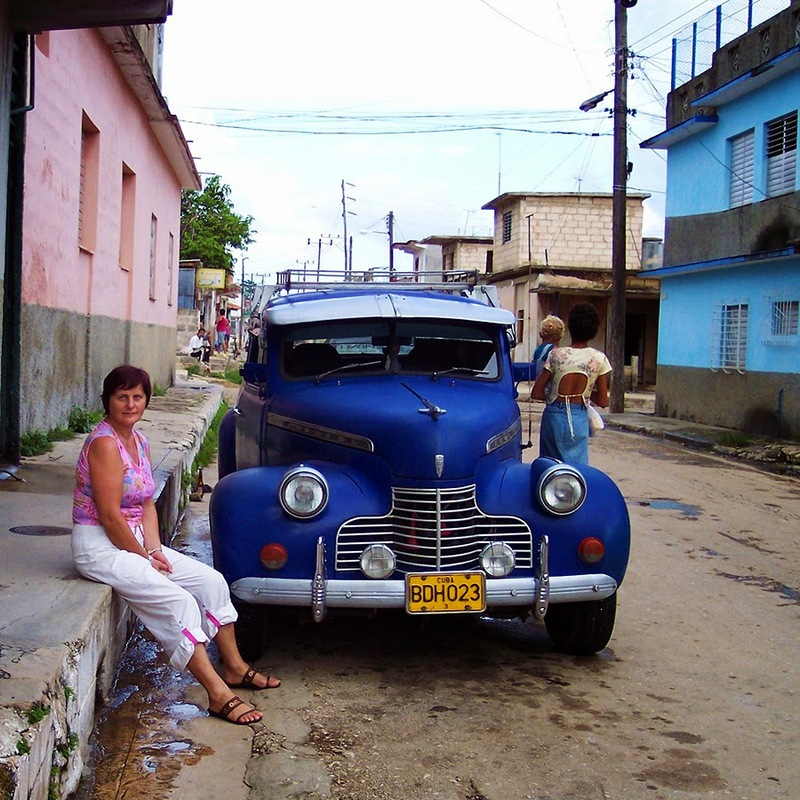 Apart from that brief period in the 1990s the Cuban government has forbidden the sale of Cuban vehicles to foreigners. 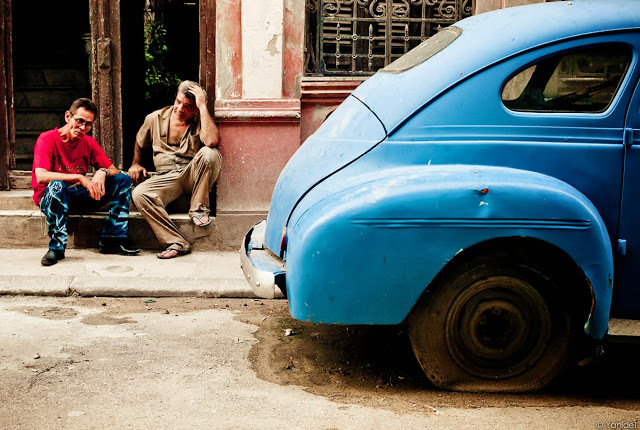 In 2011 reforms approved by a Communist Party congress legalized the sales of cars between Cuban citizens, as well as allowing ownership of more than one car per household. 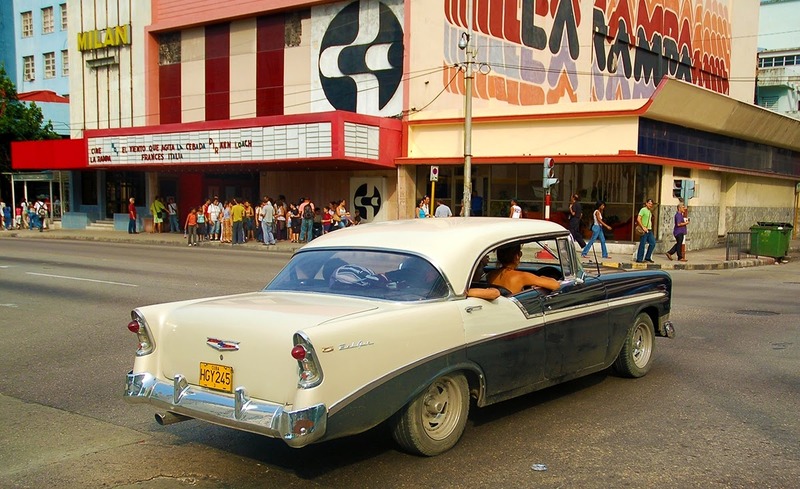 Buyers could reportedly go to state-owned dealerships, and provided that they could demonstrate that they made their money through a government approved salary (as opposed to money sent from abroad) they could actually purchase a new vehicle. But while there were thousands of purchase permits issued, only 200 cars were being made available every week and bribes were becoming commonplace. The government has apparently put the program on hold since April 2013. 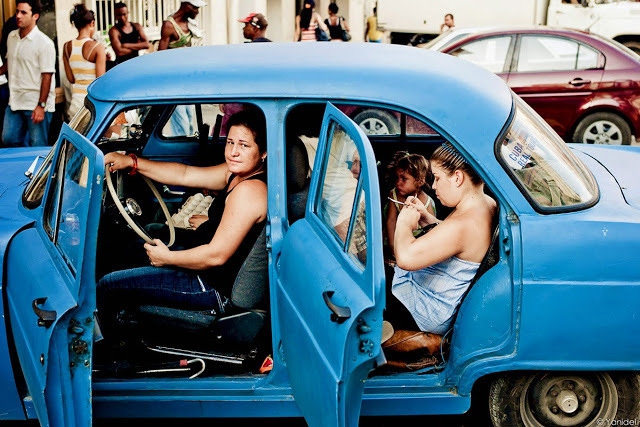 Through years of mechanical ingenuity required to keep these automobiles functioning into second or even third generations of owners, the cacharro has become a national Cuban symbol, a “surrogate for dealing with life and the system imposed by the Revolution; with its shortages, its patchwork solutions and its unfulfilled promises.” In the eyes of the Cuban Government they exist between the status of national icons and valuable exports. 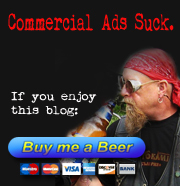 Today they are a draw for tourism, tomorrow they may be ads in Craigslist. But there is no argument that for the outside world, the vintage American “Yank Tanks” are a defining symbol of Cuba.